The sun is out, finally. It's approx. 30 degrees outside. There is still hope for a brilliant British summer and I for one have started to assemble my 2013 summer survival kit. I've noticed that a lot of bloggers like to do a "What's in my handbag?" update for their readers, and as much as I would love to show you the exciting things in my handbag* such as my keys, lip balm, tissues and purse I thought I would keep this post relatively simple. The focus: what are you bound to find in my bag over these coming summer months in London town. *more likely to be my backpack as I pretty much live in it. sandals or espadrilles - OK, they may not necessarily be IN my bag (more on my feet) but I am going to be sporting sandals over flip-flops this summer, particularly my espadrilles because they are super comfy, girly and easy to run around in. This particularly lovely pair make me feel like I am a five-year-old which oddly makes me feel happy and bouncy about everything so... YEY. 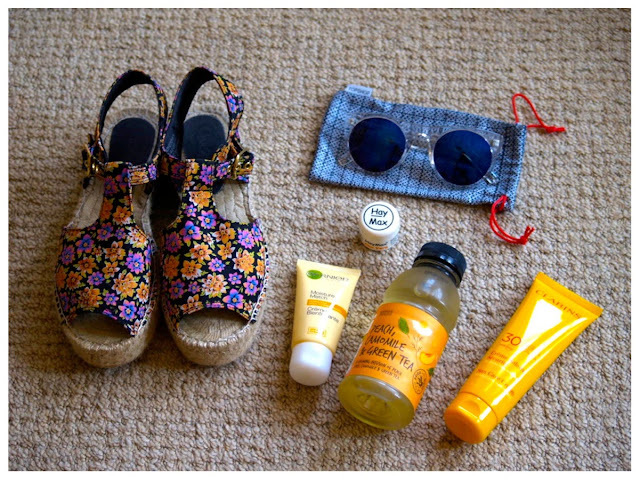 1) daily moisturiser +spf - sunny or not sunny, I always think moisturising your face is important. Particularly over summer months as it keeps the skin supple and the extra spf means I am always prepared for when the sun comes out to play. I usually use Origins A Perfect World but was given this new Garnier Moisture Match by my lovely clients so tried and am quite liking it. There are five different types depending on your skin type and what you need it for; I am using the Moisture Match Protect & Glow which does the job for me, smells nice, feels light and doesn't break the bank. 2) Hay Max - my favourite discovery this year. This little pot has been my hero against hay fever. I really wanted to avoid using lots of chemicals to battle against my not-so-favourite allergy and on a recent browse in Boots found this little gem - a natural balm which acts as a pollen barrier. I am using the Aloe Vera variant and have no idea how I've battled through previous hay fever seasons without it! 3) ice tea - for some reason, when the sun comes out all I want to drink (aside from water) is ice tea. I am currently obsessed with this new range of ice teas from M&S - particularly the Peach, Camomille & Green Tea. I'm really glad they don't make this in a bigger bottle as I would buy it and my back would not thank me for carrying it everywhere with me. 4) sun cream - I feel really strongly about wearing sun protection the minute the temperature gets above 15 degrees. For various reasons really, but my main ones are to: avoid sunburn, avoid being super wrinkly when I'm older & avoid the possibility of hurting my skin in any way. I also always try to use an SPF either at or above the current temperature. This weekend, I've been using Clarins High Protection UVB/UVA 30 - it's a little pricey but ever since mummy introduced me to it I haven't been able to use anything else. The texture is light and non-sticky, leaves a shimmery glow and smells lovely. Plus, it's paraben free. Woop! 5) sunglasses - I have officially swapped my umbrella for my sunnies yeeeeey. I cannot explain how happy I am about this. All I can say is get ready for many-a-snaps with various sunnies that I have accumulated since the age of 10. There will be some comic ones, there will be some grown up ones - either way, I will be sporting them wherever I go :) This particular mirror-glass pair are quickly becoming a favourite and I plan to spotlight some of my favourites of a similar style currently available on the high street soon so watch this space!